Be the first to share your favorite memory, photo or story of Ree. This memorial page is dedicated for family, friends and future generations to celebrate the life of their loved one. 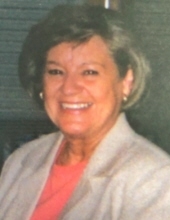 Ree Hannah Shuffett Larimore of Lexington, Kentucky, daughter of the late William Ollie Shuffett and Vester Pearl Chaney Shuffett, was born on Monday, August 28, 1939 in Green County, Kentucky and departed this life on Monday, April 9, 2018 at the Rose Manor Health Care Facility in Lexington. She was 78 years, 7 months, and 12 days of age. She had made a profession of faith in Christ and was a Certified Nursing Assistant at the U.K. Medical Center. Survivors include two sons: David Rhea Larimore of Lexington and John Thomas Larimore of Louisville; three grandchildren: Madelyn Larimore, Emma Larimore both of Lexington, and Ava Larimore of Louisville; a sister-in-law: Barbara Shuffett of Greensburg; and a host of other relatives and friends. Ms. Larimore was also preceded in death by a brother: Roy Lawrence Shuffett; and a sister: Florence Shuffett Coomer. The funeral services for Ree Hannah Shuffett Larimore will be conducted at 12:00 Noon, Central Time, Thursday, April 12, 2018 at the Cowherd and Parrott Funeral Home with burial to follow in the Liberty Cemetery. Bro. Gleason Bloyd and Bro. Ashley Shuffett officiating. Visitation is requested after 10:00 A.M., Thursday at the Cowherd and Parrott Funeral Home until time of the funeral service. To plant a tree in memory of Ree Hannah Shuffett Larimore, please visit our Tribute Store. "Email Address" would like to share the life celebration of Ree Hannah Shuffett Larimore. Click on the "link" to go to share a favorite memory or leave a condolence message for the family.